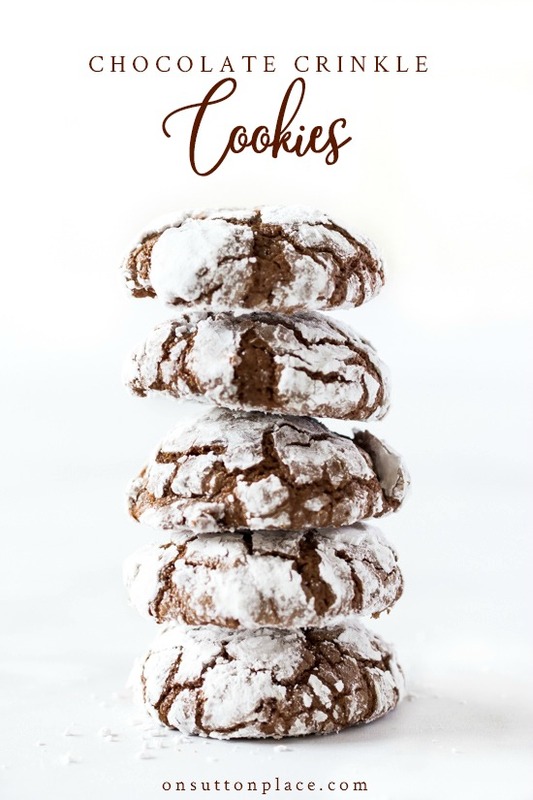 In this post: Chocolate Snowball Cookies Recipe: easy-to-make, moist chocolate cookies that stay fresh in an air-tight container for days! I’m trying so hard to stay in the Christmas spirit…I seem to be coming and going a bit these days! So I thought an hour in the kitchen baking cookies might help and guess what? It did. 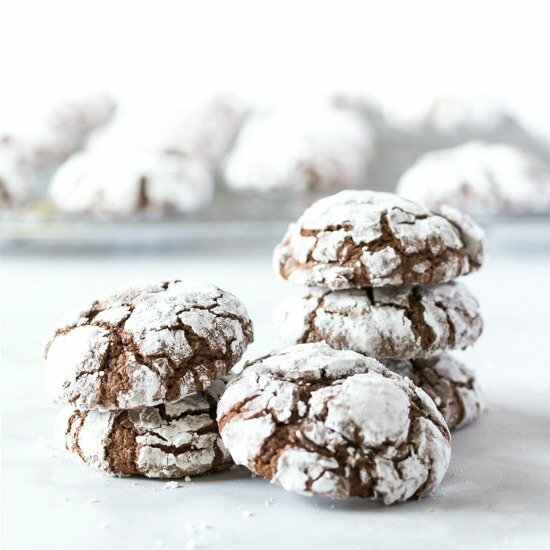 These little Chocolate Snowball Cookies (sometimes called Chocolate Crinkle Cookies) are easy, fast and oh so moist. It’s a recipe I found in my recipe box (yes, another one) that was written by my husband’s aunt. I remember making them once or twice many years ago. I wanted something a little festive, hence the snowball angle, and easy too. These little cookies are both. 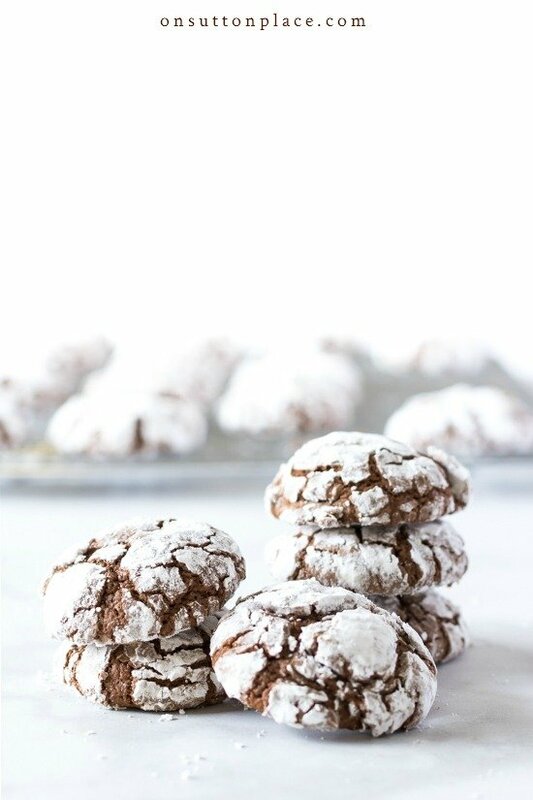 Chocolate Snowball Cookies Recipe: easy-to-make, moist chocolate cookies that stay fresh in an air-tight container for days! Stir well to combine and then cool slightly. In a mixing bowl beat the sugar and eggs for 2 minutes. Add the butter/chocolate mixture and mix well. Add remaining ingredients mixing until smooth. Refrigerate cookie dough for 15 minutes. Put about 1 c. powdered sugar in a container with low sides. Using a small 1-inch scoop, drop scoops cookie dough into the powdered sugar. Roll each scoop around until covered well. Store in air tight container. These cookies stay fresh and moist for several days. Make heaping scoops of dough. As you are rolling the scoops in the powdered sugar, make them into a ball shape. If you bake the cookies in batches, make sure to put the dough back in the refrigerator so it doesn’t get warm. These cookies stay moist in an air-tight container for several days…although they probably won’t last that long! Hi Ann…These cookies look delicious and I love that they have a longer shelf life than most. Could you please tell me how many ounces (or grams) would 2 squares of chocolate be? I want to make them as soon as possible!! I made these during Thanksgiving, and they were the hit of all the cookies we baked! Yours look fantastic! Ann, I love chocolate snowball cookies but for some reason I haven’t made any in a long time. That’s going to change now…thanks to your post! I’ve put your recipe on my “to bake” list! These cookies look so yummy. I’m thinking of making them for our school cookie swap next week. Approximately how many cookies can I hope to make from 1 batch? Yes, I will be making these next week! Thanks for the recipe, Ann! No I didn’t chill the dough Colleen…but the dough is very soft and a little sticky. I tried using a spoon to drop the dough in the sugar but switched to a scoop and it worked much better. I had no trouble handling the scoops after they were covered in the sugar though…hope they turned out OK! My mom always put the dough in the fridge overnight. Keeps them from being so sticky. I have been baking cookies already and making Chex mix. 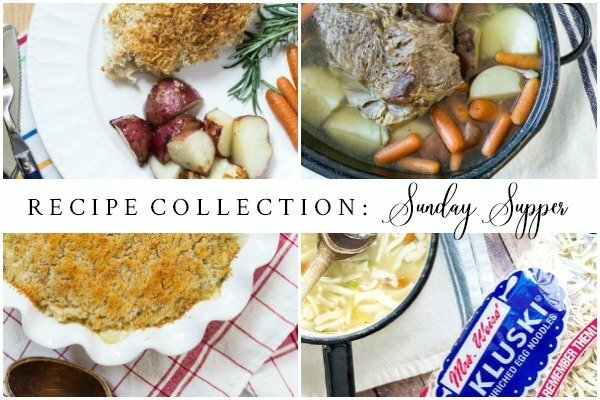 I like when old recipes call for a pinch of something. I am a baker who doesn’t measure, I use the dump method and that looks about right method. So far no failures, and I think that is more the way they baked and cooked in the olden days. My mother always made these cookies, and I have made them many times, too. They are a classic, and one of my all-time favorites! If I made those now I would definitely eat them all. They look so good. I will have to pin this one! Ha! I gave some away or I would have eaten every single one. I love old recipes like that. My grandmother’s recipe said to bake them in a moderate oven which she told me meant that you could hold your hand in for 2 seconds (1 second was a hot oven and 3 seconds was a cool oven). She was baking in a wood stove oven so they didn’t have thermostats and you had to rely on your own judgement of the temperature. 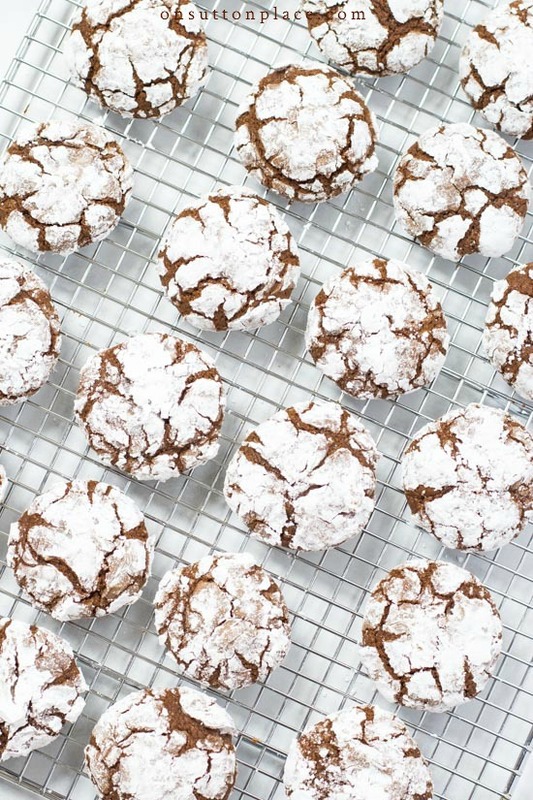 Sandy, My mom has made these all my life and calls them Chocolate Crinkles as well. They are one of my favorites and now one of my kids favorites! I just love these cookies, Ann. I’ve been making them for years. My husband’s mother used to bake these for her 7 children when he was a young boy. He still devours them! She gave me the recipe about 30 years on a piece of paper from her kitchen scratch pad. She just wrote it down, she had it memorized! The only difference is the name, she called her’s Chocolate Drops. I think they are a delightful not overly sweet chocolate cookie. Chocolate Drops is a perfect name. That’s exactly what they are! I think these cookies have several different names! The recipe has been around forever. Thanks for the comment about my pics. I am trying so hard! Ann, I added the chocolate snowball cookie recipe to this year’s baking list scheduled for next week. My husband loves chocolate, so this will be a surprise. I gave up baking Russian tea cookies. You would think since I’m retired, my Christmas decor would be completed. But grandchildren’s recitals, plays,and basketball games take precedence over my baking. Glad the kids love Cheryl’s cookies.